Thuja is an evergreen, coniferous tree that is highly popular due to its fast and dense growth habit, which makes thuja extremely suitable for hedging and other ornamental purposes. While none of the five thuja species are native to Europe – two are native to North America and three to East Asia – they will also thrive on European soil, as the thuja is tolerant of many soils, except for dry soils. Younger thuja leaves differ significantly from mature thuja leaves, as young thujas have sharp, needle-like leaves during their first year. 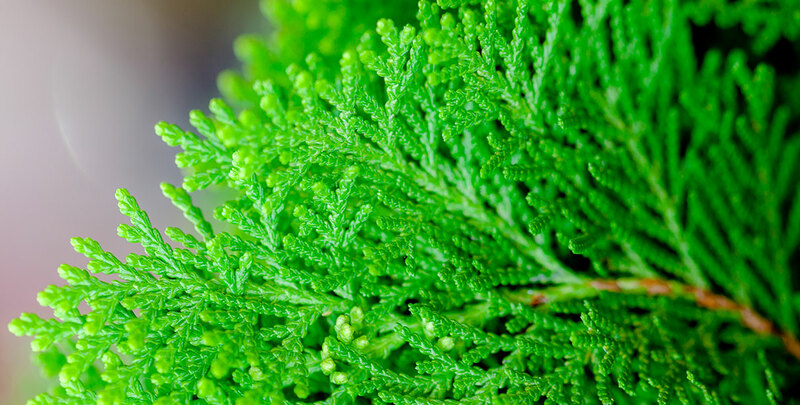 As thuja matures, the pleasantly aromatic leaves become softer and more scale-like, taking on a soft, friendly appearance which is suited to traditional and contemporary gardens alike. In many ways, thujas are outstanding hedging plants. They will grow in almost any kind of soil and since they are evergreens, the fresh colour of their foliage will make any garden look lively – even during the cold winter months. A thuja hedge is resistant to disease and easy to maintain, as it is very tolerant of pruning. Thuja hedges do not tolerate trimming into bare wood, but that should not be a problem, because it is relatively easy to keep them in shape. There are various thuja cultivars available, belonging either to the North American thuja thuja occidentalis (white cedar) or thuja plicata (Western red cedar) species. All cultivars of which are excellent hedging plants for both small and spacious gardens. In horticultural circles, thujas are commonly referred to as arborvitae, which literally translates to “tree of life”. In many languages, a translation of that name is used as the common name of the thuja. This name is a reference to the supposed medicinal qualities of its sap, bark and branches, but is also fitting because of its strong, evergreen nature and its resistance to disease. The healing power of the thuja is also what brought the plant to Europe. During his third voyage to Canada, the French explorer Jacques Cartier became aware of the function the thuja had as a native remedy and took the plant with him in order to cure scurvy among his crew. This way, the thuja occidentalis became the first North American hedge plant to be exported to Europe. It did not take long before people discovered the ornamental value of the thuja. Its hardy nature has very likely contributed to its popularity as a hedge plant in Central Europe, because it was one of the very few plants that would survive the harsh winters that are relatively common in that area. In addition, thuja wood is appreciated for its tonal qualities, as the wood of the thuja plicata is often used for guitar sound boards. The soft, light and aromatic wood is not without its constructional benefits either, as its natural resistance to decay makes thuja wood extremely suitable for outdoor construction, as well as for the structural elements of canoes. This plant has certainly lived up to its mythological reputation of being a gift to humanity. Another reason why the term “tree of life” is fitting is the thuja’s exceptional lifespan. Specimens have been found in North America that are estimated to be over a thousand years old. Therefore, if you maintain your thuja hedge properly, it will likely remain loyal to you for a lifetime. It will certainly also attract life to your garden, because thuja hedges are widely appreciated by birds and butterflies. It also makes an excellent privacy hedge due to its dense growth and even the shortest thuja species being able to reach a height of about 3 metres. 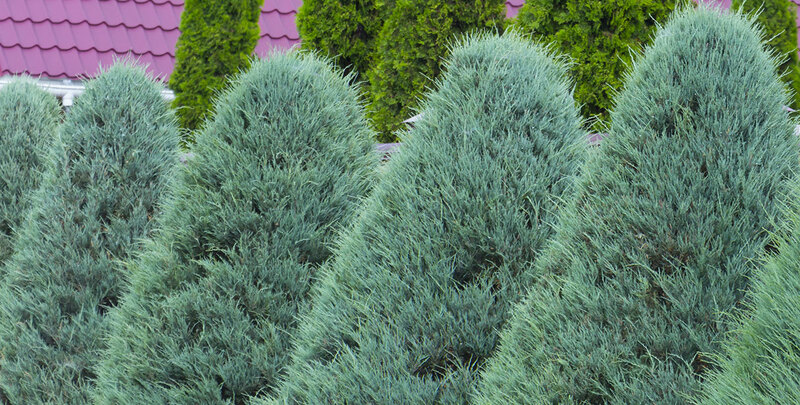 Many thuja species naturally grow in a conical shape, but with a little trimming, it is very easy to maintain a straight thuja hedge. Pruning a thuja hedge is best done during the warm months. It is absolutely necessary to prune a thuja hedge, because thuja species are relatively fast growers that require some attention to keep them in good shape. They could grow up to 30 centimetres every year. Annual pruning should be sufficient for relatively slow growing species like the thuja occidentalis, but trimming your thuja hedge twice a year is recommended. Be sure to water a young thuja hedge regularly until it is well-established, from which point they can take care of themselves. While thujas favour a spot in the full sun or partial shade, they can also grow in the shade. In addition, they will thrive in just about any soil, although extreme drought or waterlogging is potentially detrimental to their health. Why Choose a Thuja Hedge? After being imported into Europe for its medicinal use, the thuja has quickly proven its value as an ornamental plant and has grown to be one of the most popular hedging plants available for planting in European gardens. Its beautifully coloured foliage and fresh aroma will certainly make a thuja hedge a welcome addition to your garden, even if the space you have available is limited. The relatively little maintenance it requires is not very challenging and its green colour is guaranteed throughout the entire year. The white cedar cultivar known as thuja occidentalis 'Brabant' is perhaps the most popular thuja variety, although its cousin the white cedar 'Smaragd' is not far behind. These thuja varieties are known for being cost efficient, attractive and easy to grow. Whatever your conifer hedging wishes are, a thuja hedge is very likely to meet them. 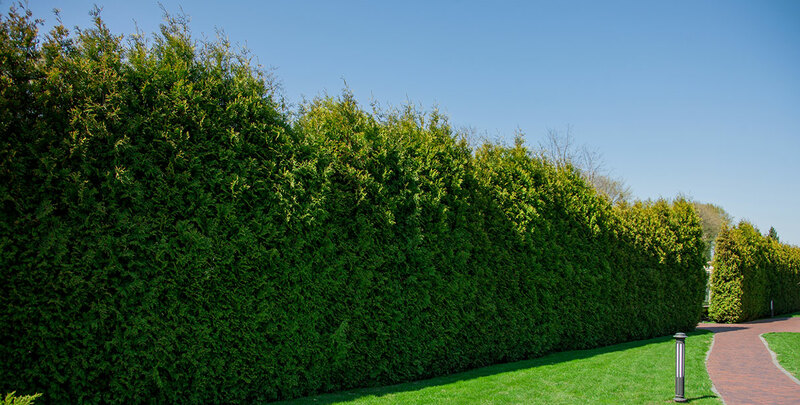 With the exceptional life span of the species and the right amount of maintenance, a thuja hedge is very likely to upgrade your garden for a lifetime. This, along with is traditional healing qualities, may just explain why many ancient civilisations considered this species to be a gift to the human race. 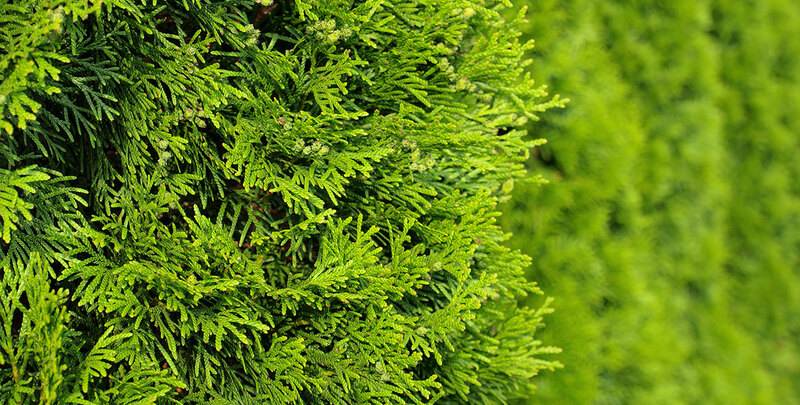 Although thuja is easy to grow and maintain, you can opt for even more convenience by ordering an instant hedge. And whether you choose a favourite such as white cedar 'Brabant' or a slightly less well-known variety such as Western red cedar 'Martin' or 'Atrovirens', there is a thuja out there that will suit you.